Put butter on a cookie sheet and put in oven. When butter is melted, remove from oven. Add pecans and stir well to thoroughly coat pecans. Return to oven and roast pecans for 5 minutes. Remove from oven and stir very well. Put salted pecans on paper towel and salt. 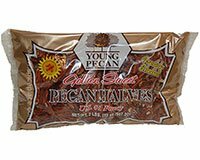 Salted pecans are good for an appetizer, dessert or a “house gift” for friends. Salted Pecans keep very well in the refrigerator.